I'm a fan of the Thursday evening Shonda Rhimes TV line-up. It gives me a chance to work on Glorious Hexagons. Here are 5 of the large, single-fabric 3-inch hexagons. These are quick and easy to work up. Makes ya feel like you've accomplished a lot. 3-inch hexagons for my Glorious Hexagons Quilt Along. Modern Mixers II, Hugs and Kisses and Happy Camper (all by StudioE). 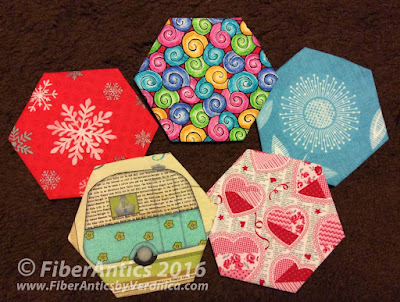 Five hexies for Cinco de Mayo. Muy Bueno!